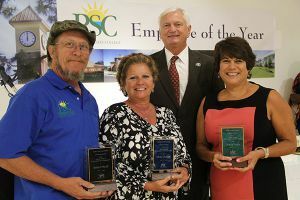 These were just a few of the comments describing Pensacola State College’s three Employees of the Year – Mary Graves, Diana Taylor and Scott Russell – at a festive ceremony in the new Charles W. Lamar Studio Gallery, July 25. 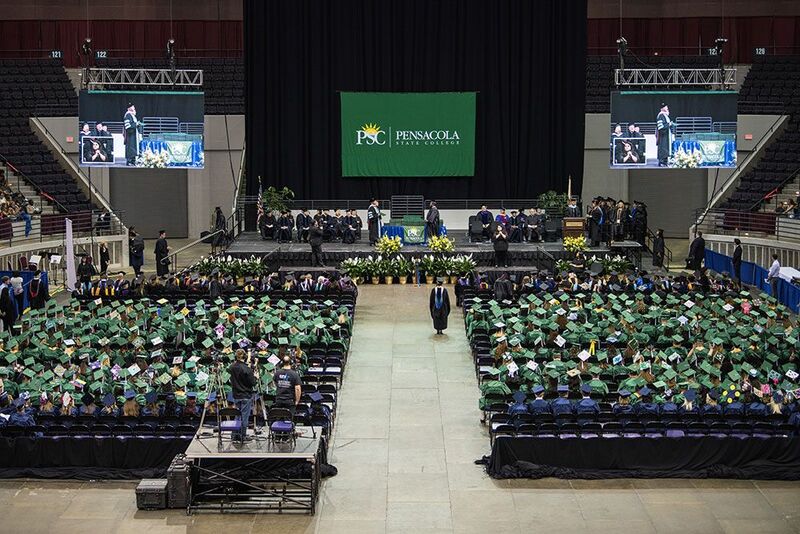 Colleagues, friends and family filled the Studio’s spacious lecture hall as PSC President Ed Meadows called attention to the accomplishments of each honoree and the importance of the annual event that began in 1975. The Administrative Award went to Mary Graves, senior computer systems analyst, who joined the Information Technology Services department in 1993. Career Service Awards were presented to Diana Taylor, accounting specialist, and Scott Russell, maintenance specialist. Following the awards presentation, there were plenty of photos, laughter, hugs and refreshments, along with more shared memories and praises for the three honorees. Coordinating the event were Human Resources Director Tammy Henderson and staff members Erandi Sanchez-Perez and Dykieria Stevens.